I don't know why this was split. Every work seems to be by the same author or at least introduced by the same author. All are welcome to join in this month’s discussion of Birds Without Wings by Lous de Bernieres. You’re invited to a discussion of Birds Without Wings by Louis DeBernieres. Louis de Bernières, A Partisan's Daughter. "Louis de Bernières (May 21) won the Commonwealth Writers Prize for his first two novels, The War of Don Emmanuel’s Nether Parts and Senor Vivo and the Coca Lord. His fourth book, Captain Corelli’s Mandolin, became a best-seller and was made into a film in 2001 starring Nicholas Cage and Penelope Cruz. It has been translated into 35 languages. He is also a musician and plays flute, mandolin, clarinet and guitar. His new book, A Partisan’s Daughter, is published in March." Louis de Bernières discusses A Partisan's Daughter. Louis de Bernières reads from A Partisan's Daughter. Louis de Bernieres discusses A Partisan's Daughter. Acclaimed novelist Louis de Bernieres will be appearing at Waterstone's Birmingham High Street to discuss his new book, a typically brilliant exploration of the delights and perils of storytelling and seduction. Louis De Bernières is currently considered a "single author." If one or more works are by a distinct, homonymous authors, go ahead and split the author. 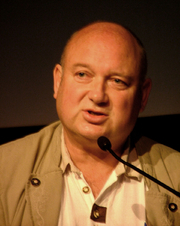 Louis De Bernières is composed of 33 names. You can examine and separate out names.